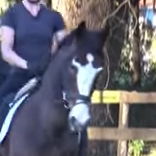 This young Dutch Warmblood has an unusual blaze -- the owner calls it a crown-shape. Check it out! And the video is neat too -- it may not be classic "dressagey" but I love the energy and exhuberance. Holy trot on that guy! I don't know if I would actually enjoy riding that or not.